Before getting a dental bridge, you may have questions. We understand that choosing the right treatment for your missing and failing teeth is a big decision. We also know that you need to feel confident that the choice you make will put an end to your dental problems, and let you live your life to the fullest. Here’s a list of the answers to questions most asked by people like you who are searching for a permanent solution that eliminates the suffering and inconvenience that they endure. If you don’t see an answer to your question (or just want some more information about our permanent implants) feel free to contact us, and speak directly with a member of our support team. What is the Difference Between Getting Dentures and Getting Teeth Tomorrow? Dentures are replacement teeth that are usually made from two (or more) materials. One type covers your gums and a different material forms the individual teeth. The teeth are glued into the denture gums, and then the denture is placed over your actual gums. You use adhesive to keep the dentures from slipping when you talk and eat. The materials that dentures are made from are porous, so they attract plaque, food particles, and the bacteria and odor that comes with them. You also take dentures out of your mouth whenever you clean and disinfect them. Plus, you need to re-apply the adhesive when you put your denture back in your mouth. A Teeth Tomorrow® dental implant bridge is precision-sculpted from a single piece of Prettau® Zirconia, and hand-finished and polished so they look like healthy teeth and gums. Your dental bridge is held permanently in place by dental implants, so you don’t have to use adhesives or ever take it out of your mouth. You clean it just as you would brush natural teeth (except there’s no need to floss). Prettau® Zirconia is non-porous, so it doesn’t attract plaque and resists odors and stains. It’s made in one piece, so it resists the chipping and cracking that comes from joining two different materials together (like in a denture). Teeth Tomorrow is a permanent solution. The cost of a dental bridge from Teeth Tomorrow is more than getting removable dentures, but is most often less than the expense of trying to save your failing teeth over the long term. Every patient’s case is unique, so the price can vary. The best way to find out the cost for your treatment is to contact us at 845-679-3706 to discuss your treatment options and available financing. What Do I Have to Do to Care For My Teeth Tomorrow® Dental Implant Bridge? 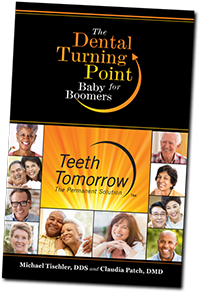 Your Teeth Tomorrow® dental bridge is designed to be a permanent part of a healthy mouth. Since you don’t take it out, you brush it just like you would clean normal teeth. You see your dental hygienist on a regular schedule, but your Prettau® Zirconia bridge does not attract plaque or food particles, so there’s no need to floss. Do I Have To Take Out My Teeth Tomorrow® Dental Bridge at Night? Your Teeth Tomorrow® bridge is fastened to its dental implants using precision-manufactured screws that are hidden within the dental arch. You never remove it. Your dentist can access these screws to make adjustments, check the stability of your implants, and ensure the continuing health of your mouth. Can I Travel During My Teeth Tomorrow® Treatment? The healing process that occurs as part of your Teeth Tomorrow® treatment requires special attention. During this time, your implants are becoming a part of your mouth through a process called ‘osseointegration’ or the direct structural and functional connection between your jaw and each implant. So while you can travel, it’s important to let us know when you’ll be away, follow all of your doctor’s instructions, and schedule a follow-up office visit for when you return. Will I Be Sedated During My Teeth Tomorrow® Treatment? Sedation may be recommended for certain procedures during your Teeth Tomorrow® treatment, and is not required for others. Your specific treatment will be determined by your unique needs and requirements and the recommendation of your Teeth Tomorrow® advanced implant dentist. The team at Teeth Tomorrow is happy to answer any additional questions you may have. You can call our office directly. Contact us today for your no-obligation consultation. Tell us about the challenges you are experiencing, and we’ll give you answers and options. Find out if you are a candidate for Teeth Tomorrow.